In addition to the interest of contributing to the solution of problems of Arctic science, the contacts made during the preparation and fulfilment of such expeditions must tend towards friendship between nations and to a wider appreciation of the capabilities of one’s fellows. In 1932, six undergraduates self-prescribed their antidote to the Great Depression, independently organising their first unguided expedition to Europe’s largest ice cap, the Vatnajokull in Iceland. The objectives were far from simple. With an average age of 24 years they set out to execute a double traverse with an extended stay at a base camp to be established just off the northern edge of the glacier. From here they would conduct a number of scientific objectives, namely to map the glacier tongues of the region and to characterise the flora and fauna. 87 years on we, a team of three friends from University discovered their diary. Their scientific descriptions of the route and region quickly gave way to poetic lyrical descriptions of the beauty, power, and vastness of their environment. Captivated by their complete journey; the organisation, the fundraising, the planning, the friendship, the difficulties, the scientific rigor, the beauty, we had our minds set. The only way to see what they saw, to feel what they felt was to walk in their shoes. Or, rather, ski in their ski trails. However, a faithful recreation wasn’t going to cut it, with it we would always be there as guests to their party. We were compelled not to directly recreate their trip but to recreate the spirit of their objectives so we could go on our own journey. Our headline scientific objective is directly inspired by their detailed observations of the flora and fauna in the volcanic region around Kverkfjoll, north of the ice-cap. While native communities near the ice cap will have been extremely familiar with their findings they clearly felt as if they were the first pioneering people to discover these “oases” teeming with life. 87 years on we want to take their enthusiastic characterisation to the microscopic oases. 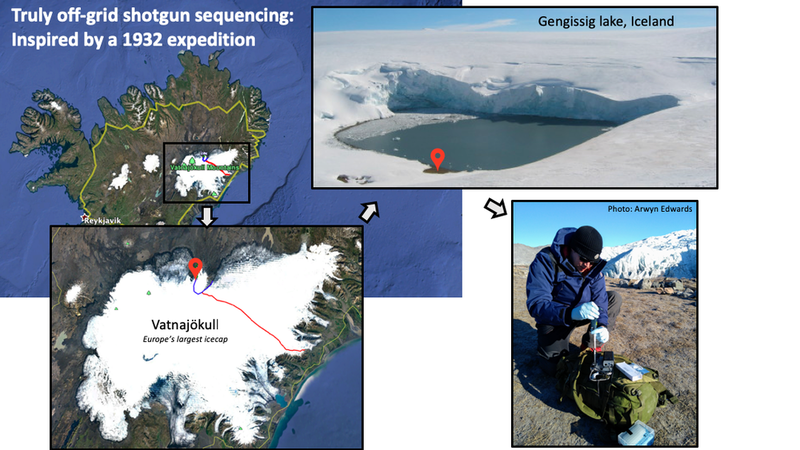 With expertise in microbial genome sequencing using Oxford Nanopore devices we plan to shed light on what microbial communities exist at the intersection of glaciers and volcanoes or, more poetically, ice and fire. One major obstacle stands in our way. No one has yet to perform fully off-grid nanopore sequencing relying on solar power only with no internet or backup power in a polar environment. To complicate matters this will be performed after a 60 km ice-cap traverse. In the pioneering spirit of the 1932 team we have not been dissuaded and have established a close collaboration with Dr Arwyn Edwards to adapt all our protocols to ensure the highest likelihood of success. Our proposed route including a 60 km crossing followed by 2 weeks completing our various objectives on the northern edge of the ice cap. We set off on the 14th April and have planned to live on the ice-cap for 20 days. Check back for updates as we progress.